This is Curt’s most popular (and affordable) show, perfect for small to medium size audiences. If you’d like great entertainment but don’t need the larger Las Vegas-style illusions of Shows A and B, this show is perfect for your event! Packs small, but plays big with plenty of great magic, clean comedy and audience interaction that is ALWAYS a hit with both corporate and private groups! Curt’s show will appeal to EVERYONE in your group: all ages, all nationalities. It’s amazing, intelligent, fast-paced and fun. Newspapers are shredded and instantly restored. Things appear and disppear. It looks like real magic, but of course it is all sleight-of-hand perfected over thousands of performances. 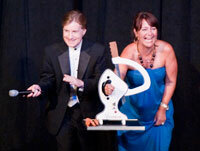 Curt’s unique talents combine side-splitting CLEAN comedy with amazing magic routines and audience interaction. This special combination creates a fun event that is ALWAYS a hit with groups just like yours. EVERY show is a GREAT show! One of the things that makes Curt’s show so special is that your group actually participates in the show, making your event a unique experience! A veteran of over 25 years peforming at Corporate Events, Curt is an expert at choosing volunteers and making sure they have a GREAT time. Curt always makes sure volunteers are heroes and never embarrassed. Everyone has fun! Audience interaction is the key to making your event truly fun and entertaining for everyone.